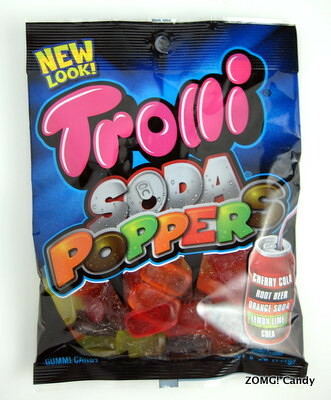 The Soda Poppers came in Cherry Cola, Root Beer, Orange Soda, Lemon Lime, and Cola flavors. 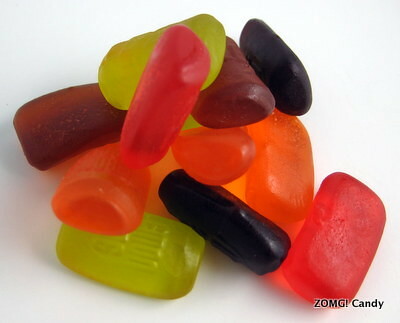 As a whole, the bag smelled of root beer, and a faint root beer tinge tainted all of the gummies’ flavors. 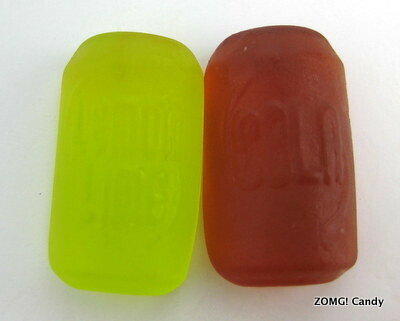 Each gummi was shaped like a little soda can and imprinted with text naming its flavor. They were soft with a pleasantly bouncy chew. Orange soda (orange) was a mild floral orange with a faintly fizzy undertone. The flavor was neither bright nor tangy, so I only found it middling as far as gummi oranges go. Lemon-lime (yellow green) was sweet with a mild citrus undertone. I wanted it to be more tart and tangy. Cola (reddish brown) tasted mildly of, well, cola. Cherry Cola (red) tasted similar with a fizzy, generically red fruity flavor. 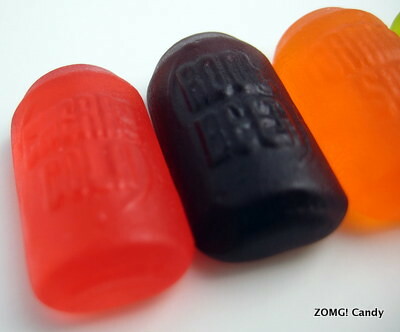 Finally, root beer (purplish brown) was the strongest of all the flavors, hence its ability to contaminate all the rest of the gummies. To be fair, its root beer flavor was pretty spot on; it just isn’t my favorite soda flavor. While I loved the texture of these guys, I thought most of the flavors could’ve used a lot more punch. Only an O because I wanted more flavor that these guys didn’t deliver. For a better soda flavored gummies, I would recommend taking a look at Hi-Chew Fizzies!